I'm getting closer and closer to the close of construction and decoration of Villa del Vigneto - and the closer I get, the slower I want to go. But there are enough remaining steps to finish that I can drag my feet and drag this out for another couple of months. 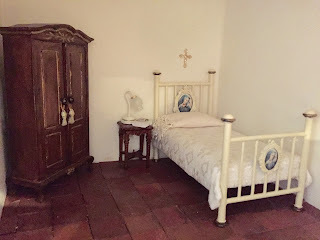 There's still a third bedroom to bring into being, and many flower pots and planters to fill, and more vines that need to climb that false back wall - and, of course and always, there's that tile roof to finish. According to my construction journal, I started designing and working on the villa on October 13, 2015, so maybe it's high time to be finishing up! 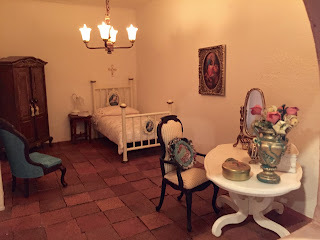 This bedroom will belong to the older "spinster" sister of the villa's owner. She travels from Florence each summer to take up residence with the family for a few months. The decorating started with these potentially useful pieces of furniture and fabric. Next, I decided on a furniture arrangement that would work with the shape of the room. NOW - LET THE MAKEOVERS BEGIN! This chair, which I found at an estate sale last year, was originally a bright mustard color, and one leg had come off. I used fabric paint and a small, stiff brush to change the color to a deep teal. The bottom photo shows the broken leg all mended - but the fabric color looks much lighter than it really is. The top photos are much closer to the actual color. You may notice that this is a different armoire than the one pictured in the assembly above. I was going to paint the armoire but decided to use a wood stain instead. The first armoire had a natural finish with a sealer applied, so I couldn't use a stain. I switched to this unfinished one and will use the other in the third bedroom. ...then a coat of satin varnish. ...and finished it off with new knobs and tiny tassels. Then, using my favorite flower-making (contriving) technique, I snipped bits of leaves and flowers from real-size artificial flowers, painted them, and fashioned a bouquet for the new table. The table is now used as a combination writing/dressing table. 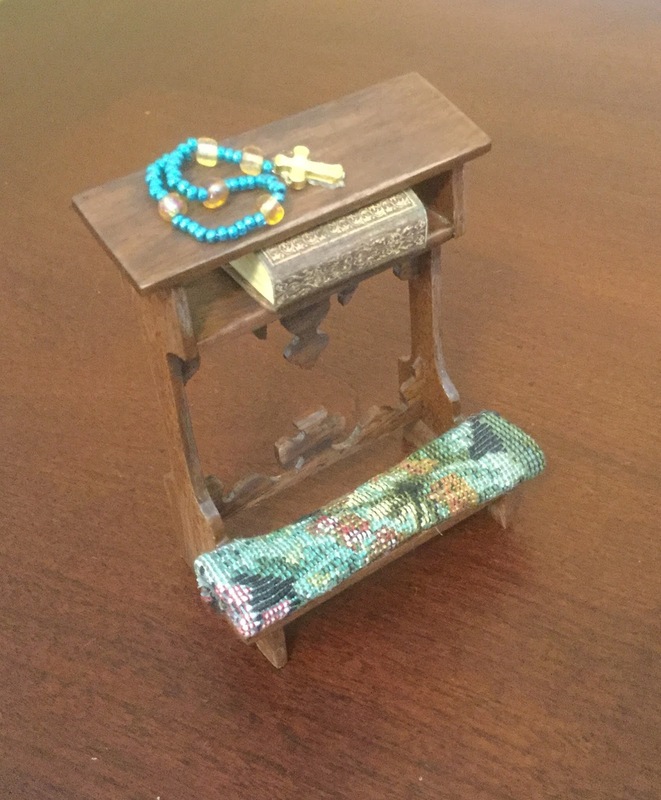 This prie-dieu, or prayer bench, needed just a bit of aging and a pad for the kneeler. I cut out a small portion from a larger piece of tapestry fabric for the pad. I also made a small cushion for the chair that belongs to the writing table. This chair is a substitute for the tall-backed one that I showed in the "assembled pieces" photos above. I realized that the high back obscured the view of the bed. This one works much better. I bought this small plastic Virgin Mary figure during one of the Nebraska Junk Jaunts, and I've been saving it for the prayer corner in this bedroom. The figure was very obviously plastic, and I wanted it to have more of a stone or plaster finish, but I didn't want to cover the color or the detail, so I used several coats of Mod Podge and glue to cover the plastic finish. Then I touched up the paint with a similar color. There really isn't much difference, but it does look a little less like plastic - and a little more worn! I needed a rosary. I'm not a Catholic, but one of my daughters is; she let me borrow a rosary so that I'd know how to make one. I had trouble getting the size right and had to make mine too short in order to keep it to scale. After it was finished, I realized that the addition of the ten beads that it lacked would probably have been all right. I may need to make a second proper one. The finished prie-dieu with a prayer book added. I've had this brass bed in my stash for many (and many more) years. I used it in the first dollhouse that I made. That house was eventually turned over to grandchildren, but I put the bed away for future use. The future is at hand. The bed received a new look with Antique White paint trimmed with an antique, tarnished brass finish. I found small picture frames of different sizes, also in my stash, and made prints of the Virgin Mary in sizes to fit the frames. I added matte Mod Podge to the prints for texture. I dry-brushed an off-white paint on the frames and glued in the prints. Then I decided that more white on the frames would look better, so I added more paint to cover all the brass/gold finish on the frames. The finished bed frame with the Virgin Mary medallions glued on. I bought this damask napkin at an antique store a few years ago and had planned to use it for a coverlet on a bed in the French Farmhouse, but I changed my mind and kept it for the villa. I found the beautiful, soft lace in a bin of my sewing supplies and knew that I had to use it to trim the pillow case. I love the long, cascading lace on the pillow cover - and I'm happy with this second simple bed! These are the last pieces to get a makeover. I darkened the wood finish on the bedside table, although it doesn't show up well in this photo. I also painted the lamp and added gold trim. I like the early-morning (or late afternoon?) light in the two photos above. The room looks so restful. The large crucifix was another Junk Jaunt find two years ago. 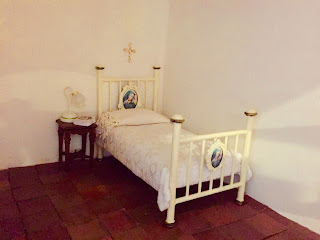 As I recall, that's when I decided that one of the villa's bedrooms would have a prayer corner. The shape of this central bedroom lends itself well for that purpose. Then I decided to add a sewing box to the room, although I haven't decided whether to keep it there. Its busyness may detract from the tranquility of the room. Or sewing and mending may give the sister-in-law a quiet occupation for her hands while she meditates on other matters. This is a long view from the prie-dieu down the hallway to the small window in the back wall. When I began laying white tiles on the back side of the roof, I waited until the tiles were glued in place before I painted them - and it was a slow, painstaking job that I wasn't eager to repeat. I painted the next batch of white tiles, in the photo above, before laying and gluing them to the roof, and that was faster, but still took much time - just not so painstaking! 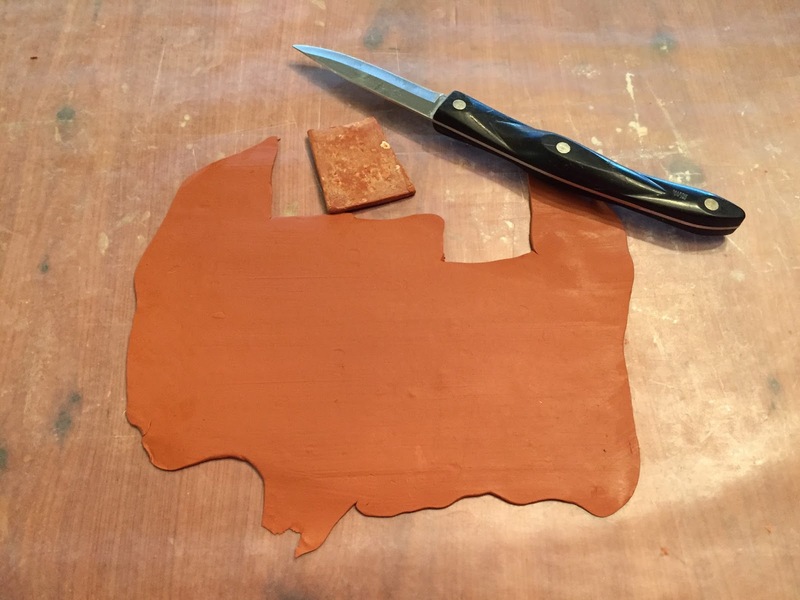 So I was determined to try again to use the terra cotta colored Sculpey to save time and trouble. I decided to chill the Sculpey before using it, to see whether that would keep the clay from becoming too soft as I worked with it. I first tried chilling a ball of clay before I rolled it out, but it turned very crumbly and refused to stay together. Then I decided to roll out the clay to the desired thickness before chilling it. I placed the rolled-out clay between sheets of waxed paper and chilled it in the refrigerator. That worked beautifully - I could roll out several sheets of clay and keep it in the refrigerator until I was ready to cut more tiles. The clay retained enough chill to allow me time to cut as many tiles as the sheet of clay could produce without becoming too soft. All the tiles are laid and glued to the tower roof as well as the back side of the roof. I've started laying the flat and lipped tiles to the front side of the roof. You can see the guidelines that Robert drew on the roof to help keep the rows of tiles straight. ...followed by the curved tiles. I've laid these on loosely to be sure they all fit well before gluing. That's the extent of the roof progress to date. During April, I will finish gluing on all the curved tiles, then lay the ridge line tiles and apply mortar around the chimneys, edges, and inside the front tiles. I'll also make chimney caps using both flat and curved tiles, then age all the tile work with various paints. Meanwhile, in Nebraska, cold weather lingers on and on with not much promise of warmth - although the daffodils are starting to pop up, seeking what little sun there is. While I stay warm inside my workroom, I can watch Robert out my window as he takes care of some necessary spring clean-up. I'm hoping that Spring will take the hint and make an actual appearance. I wish you each an April filled with abundant sunshine! I love your furniture makeovers Marjorie! The room looks so serene. Putting the Virgin Mary frames on the bed was an inspired idea and I really love your idea to paint away the mustard fabric on the chair. I must try this with some of the chairs I have that have questionable fabric choices on them :D The roof is coming along wonderfully.. it looks like you are nearly done! Just as you are wishing for spring, I'm wishing for Autumn to arrive.. we are having an incredibly hot Easter weekend here.. Feels just like the middle of summer.. and I can't wait for Summer to finally leave us. :) I guess it's true what they say about the grass being greener on the other side of the fence. haha. Hi, Sam - Thank you for visiting Villa del Vigneto and leaving your lovely comments. You're so right about that greener grass on the other side of the fence! I'm envying you that hot Easter weekend, since we had snow for most of Easter Sunday, although the sun did show itself late in the day. I'm hoping that we can both have the weather that we're wishing for - and soon! At least with our mini projects, we have something to keep us entertained and busy while we're waiting for the weather to change to our specifications. Great makeovers! I especially like the wardrobe. What a difference it made and breathed new life into some pieces that needed a little TLC. Thanks for the tutorial on your floor and roof tiles, they look so realistic. Hello, Simon - I hope you enjoyed your Easter weekend away. Thanks for taking the time to visit the villa; I appreciate your comments. I'm glad that you like the wardrobe - it was a fun piece to work on, because there were no glitches or glaring mistakes during the process. I can't often say that about my creative endeavors! Beautiful work Marjorie! I have to say that I can easily picture your maiden aunt praying religiously in her bedroom, because you have built the entire room as a refection of her pious personality and it works! Your roof is SPLENDID and I'm glad that you've hit on a method of chilling the Sculpy to aid you in your tile-making. I can see that your diligence has paid off- MOST IMPRESSIVE!!! Hi, Elizabeth - I'm happy to hear your opinion about the maiden aunt's pious personality, since that was just the image of her that I was striving for. She has been persistent in hoping for that particular room for her own almost since the beginning. I tried very hard to assign it to one of the daughters of the villa family, leaving the aunt on her own in Florence during the summers. But she has a very strong will, in spite of her piety, and simply appeared in the room one day and refused to leave. I had no choice but to make it her own! Thanks for your comments on the roof. It was such a relief to finally figure out a way to use that terra cotta Sculpey for the tiles; I've saved so much time with the new technique! As always, I appreciate your comments. Una habitación perfecta para esa hermana soltera,recta y tan religiosa,seguro estará a su gusto!!! Buena idea la de enfriar el barro en la nevera para poder cortar después las baldosas! El tejado se ve impresionante,ya casi has terminado,enhorabuena!! Hello, Pilar - As usual, I'm so happy that you visited Villa del Vigneto. Thanks for your nice comments on the spinster sister's room. I enjoyed working on that room immensely, and now I can't wait to get started on the third - and last - bedroom. I also appreciate your comments on the roof. It's coming along as planned, without too much trauma, but I'll certainly be happy to have it finished! Perfection yet again. I love the furniture transformation. The armoire is fantastic and the gold detail really makes it unique. I love how you painted the chair and the desk and prie-dieux are fantastic pieces. The bedding is lovely and I think the religious items you included in the space are what make the room feel so right and so realistic. The prayer corner is such an inspired idea and I have relatives who's rooms look just like that. It feels perfectly authentic and very well thought out. Bravo! The roof looks incredible also. Great idea to chill the clay. Hello, Giac - Thanks so much for your thoughtful comments. As you can probably tell, furniture "makeovers" are my favorite things! (I do the same thing in real life, but it's so much easier in miniature!) The items for the prayer corner just turned up one at a time until I realized that it had sort of planned itself; so I had to go along with the plan! It was a very satisfying project. The roof is coming along better and faster than I hoped, but I'm so glad that the chilling technique works - what a time saver to use the terra cotta clay. As always, thank you for your interest and input. Hello, Alayne - How nice to hear from you again! I'm happy that you took the time to visit Villa del Vigneto. I enjoy doing furniture makeovers, and this bedroom was an especially interesting one to put together, since the spinster sister definitely has a strong personality. I simply followed her instructions! The roof has been a major project and has required a major effort, but I think that I'm going to be happy with it in the end - which is coming soon! Thanks for your lovely comments. Your bedroom is beautiful! You did good changes and transformations. New colors give sometimes so different look! Thanks for taking the time to stop by the villa. I really love to re-do furniture to get just the colors and the look that I want - it's a very satisfying process! I'll have that pleasure all over again soon when I start the third bedroom in the villa - I'm looking forward to having a lot of fun with that room! I appreciate your nice comments! Hello, Carol - It's so nice of you to visit Villa del Vigneto, and I'm happy to know that you liked this new post. As you've probably guessed, I really love creating room settings that involve a lot of makeovers - it's so satisfying and so much fun! I appreciate your nice comments - please visit again! Oh how I love all the space you've created for each of these rooms! And the way you add just the perfect amount of necessary items. The arrangement of them is wonderful! So much thought and attention given to each and every thing! What a great solution to the soft clay! Now when you're in the mood to roof, you can just pull out the sheet and go! You'll be finished in no time, and it is really wonderful to see! Hello, Jodi - What nice comments you've made on the villa rooms! Thank you so much; I really appreciate your input, since I'm a great admirer of your own work. I admit that I enjoyed working on this second bedroom immensely. It seemed to create itself; I just did the fun part and put it all together! I'm happy that the chilled clay technique is working so well for the roof tiles - and you're right about the luxury of just taking a rolled-out sheet of clay from the fridge and starting to work. What a time saver! Thanks for stopping by the villa. El cambio no podía ser más acertado , has dejado una habitación perfecta para la cuñada, a la vez sobria pero muy acorde con todo el resto de la Villa, me encanta.Mi admiración por el proceso de tu tejado, mis felicitaciones , ya te queda menos . Hello, Rosa Maria - Thank you for your nice comments on the sister's bedroom. Her personality seemed to present itself as I worked, and I often felt as though she was directing my efforts - so I had to make the room as she wanted it to be! I'm satisfied with the way the roof work is progressing, although there's still quite a lot of work remaining. But I think the hardest part is over! I hope that spring - and especially spring flowers - will come quickly, for both of us! Great job on the furniture! I have used a marker on some fabric furniture, but not paint - I will have to give that a try. I am impressed with the clay tile. It is looking great and very realistic. Looking forward to seeing more! Hi, Troy - Thanks for your comments. I've painted several pieces of upholstered furniture and have been satisfied with the results. The painted fabric may look a bit stiffer than the original, but it still looks fine. The fabric paint seems more like an ink or a dye than paint. I'm glad that you like the roof tiles; it's a very labor intensive project, but also very satisfying. But I'm glad that it's almost finished! Marjorie, I love all the little details! The idea of mod podge and paint over plastic is brilliant, I will have to find something to try it on. And I love the makeover of the bed. Actually, I love everything, you are doing a beautiful job. Hello, Megan - It's so nice of you to stop by Villa del Vigneto, and I appreciate your comments. I've found that Mod Podge is handy for quite a few things, including dulling down a shiny finish or adding texture to a flat surface - or covering up a plastic finish! I'm so happy that you like the bed; I had such a good time doing that makeover! I'm going to do another fun bed makeover this month, so I hope you'll stop by again and check it out. Dear Marjorie, I love, Love, LOVE the transformations you have worked on all those disparate pieces of furniture!!! You have taken the mundane pieces and made them not only unique but beautiful and perfect for the Time and place of this Villa! I think the details on the bed are Inspired! The Prie-dieu is such an unusual and totally fitting addition to the room! I Love it! And the rosary too.... my sister (who is Catholic) made one for my Dollhouse and I treasure it! I think making the Armoire dark walnut was just the right choice and making the dressing table white is equally appropriate! Old houses didn't usually have "matching sets" of furniture... and these pieces look old and real and at home in this room! The peaceful atmosphere is just what one would want in the "extra" room that gets "taken over" by spinster aunts! LOL! I am also really glad to see you are having success with the chilled sculpey for the roof tiles! It surely is saving a lot of effort with the painting and it looks Awesome!!! I really admire your perseverance with the roof tiles.... I know how much devotion it takes! As for the approaching "end of the project" horizon..... (gosh I hate finishing things!) I really hope you have more mini creations in mind for the future!!! It would be a shame to have nothing more to do! LOL! As usual, I look forward to every update on your projects!!! Hi, Betsy - Thank you so much for all your lovely and encouraging comments! I'm thoroughly enjoying this phase of the villa construction; I love "creating" the different rooms for the villa's occupants. I find myself wishing that there had been space for even more rooms - but this house seems huge already, so it's just as well that I stopped when I did! But I am glad that I have one more bedroom to create, and I'm impatient to get started on it. It was quite a relief to find that chilling the Sculpey actually worked for making those roof tiles, and I've successfully finished making all that I need in order to finish the roof. (I think!) Thanks for the tip about chilling the clay. And rolling it out beforehand and storing it in the refrigerator made it wonderfully convenient! I'm not sure when I'll need to use Sculpey for a future project, but I'm sure that I will at some point - and I'm prepared now to take it on! I'm sad that the villa construction is soon to end, but I'm already doing some research on my next project - a MUCH smaller undertaking - and I'm very excited about it, so I'm hoping that you'll continue to follow along! Hi Marjorie, Great post. Thank you so much for all the details of how you transformed very ordinary things into something so distinctively correct for your bedroom. The sister-in-law definitely needs that wonderful sewing box - it makes her feel needed as she creates beautiful needlework and possibly even does some repair work for the family. Of course it is also a good excuse to escape at times. Hi, Janine - I think you're absolutely right about the sewing and mending work that the sister-in-law does for the family; it is important for her to feel needed and as though she's contributing to the household chores. She is, after all, more than a welcome guest; she's a welcome member of the family! 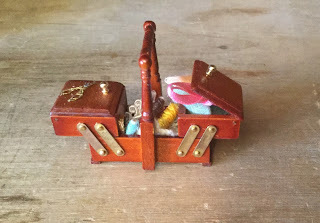 Thanks for that insight - so the sewing box stays! Thank you as well for visiting the villa and for leaving such nice comments. AMAZING!!! I love the aunt's bedroom (her bed especially)! And I have to find some of that fabric paint -- there's a hideous blue fabric chair for sell in my store that I love the shape of, but the neon blue fabric is terrible for the style of the chair. But that paint looks like an easy fix to the problem! I didn't even know it existed. Thank you for sharing! - Lori K.
Hi, Lori - I'm so glad that you like the second bedroom and the bed. The bed was one of my favorite things to transform, and I really enjoyed working on it. I've used fabric paint several times and have always been satisfied with the results. I found mine at Hobby Lobby. It wasn't in the usual craft/stencil paint section; it was in the same area where all the puff-painting and T-shirt embellishments are found. The colors are limited, but you can mix colors together to get one that you like. I hope it works for you. Please stop by the villa next time - the third and final bedroom is coming up! Marjorie! What amazing work you have done. I absolutely love your prayer room. It has such a lovely tranquil feeling. The sheer volume of work you have done is admirable. I tend to go in fits and starts. And as for your roof tiles. Wonderful. BTW, thank you so much for coming to visit me on my blog. I did not expect anyone to bother with me because of my long silence. Its good to be back mini-making. Now back to work on my sofa using a Kris 1inchmini's tutorial!! Hi, Carol - I'm so glad that you like the work that's been accomplished on Villa del Vigneto. I love doing this stuff so much that it's easy to keep at it; but I admit that having a blog to write is motivational as well! (If I'm going to be a blogger, I'd better have something to blog about!) It's great to know that you're back to your mini-making. Have fun with that sofa tutorial!